In a perfect world, giving a real person CPR would be as easy as blowing up a balloon and pushing down the contents of an overflowing bin, to cram in yet another bag of rubbish before collection day. No panic. No sudden rush of adrenaline. No drama; because you know what to do, right? You trained for this. In reality, it’s always going to be a pretty big deal. It’s not every day you’re called upon to save a life. Your heart will be racing and your palms will be sweating, as you recall your training and spring into action. It’s that training that gives you the confidence to be the hero; to come to the rescue when others simply stand by waiting for help to arrive. Pretty normal questions. Now imagine it’s a child! Now, we could bore you with theory all day. And you’ll be able to learn how to give CPR, remembering the simple instructions. But you won’t have any practical experience until the real thing. Which is why we’ve endorsed hands-on CPR training with the best manikin training dolls in the business. Ultra realistic manikins, of all shapes and sizes, designed to demonstrate exactly how CPR works and what you need to do. This way, you’ll have already experienced what it’s like to give CPR, perfecting your technique so you’re ready for the real thing if the time comes. 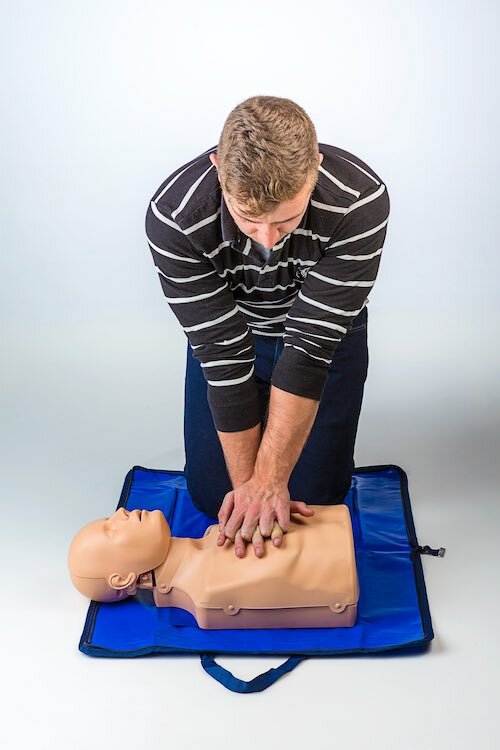 We offer two variants of first aid CPR courses that include practical training. The first is a full classroom course. We have over 1000 instructors across the UK, who can provide classroom-based training at your facility or off-site. A cheaper, less time-consuming alternative is the blended learning option! By reducing time in the classroom and making a portion of the course available to be done online, you can complete it at a time and location convenient for you! Once you’ve finished the online section of your course, you can call us or visit www.protrainings.uk to book your classroom session, to complete your certification. Practi-Man manufacture a range of innovative manikins, and we’re proud to be the only authorised UK distributor of the brand. Realistic in design, you’ll see the chest rise as you give rescue breaths. You’ll feel the rib cage, the organs, as you push down on the chest, whilst humming ‘staying alive’ in your head to keep up the correct rhythm. You can have the opportunity to try CPR on a life-like child manikin too. We also offer other brands such as Prestan, Little Annie, Sani, Brayden. Alongside our human manikins, we offer a dog manikin!… This unique product by Stimulaids allows us to give pet CPR lessons in this practical manner too. Side note – Hygiene is important, so make sure to stock up on your consumables such as mouth guards, manikin faces and antibacterial wipes! Call us to discuss equipment on 01206 805380.